Hardwell has been nominated for a 12 awards at the 31st Annual International Dance Music Awards in Miami, including nods for ‘Best Solo Artist’ and ‘Best Global DJ’ amongst others. His label Revealed Recordings also picked up a nomination for ‘Best Global Music Label’ and following its recent landmark 250th episode, ‘Hardwell On Air’ was acknowledged in the ‘Best Podcast or Radio Mixshow DJ’ category. 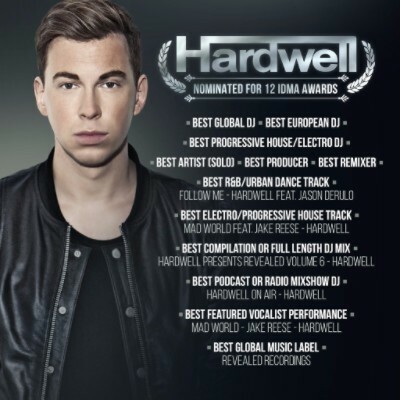 Standing as one of the most nominated artists in this year’s awards, Hardwell continues in good for 2016. His 2015 track ‘Mad World’ ft. Jake Reese is a candidate for both the ‘Best Electro/Progressive House Track’ award and the ‘Best Featured Vocalist Performance’ prize, whilst his collaboration with Jason Derulo ‘Follow Me’ will be competing for the ‘Best R&B / Urban Dance Track’ award. He is also nominated for ‘Global, European’ and ‘Electro/Progressive House DJ’, however, with further nominations for ‘Best Producer’ and ‘Best Compilation or Full Length DJ Mix’, bringing his totally tally of nominations to 12 in total, it’s been a good start to the year.